Yes, it’s another painted flag with more yet to come later this week! 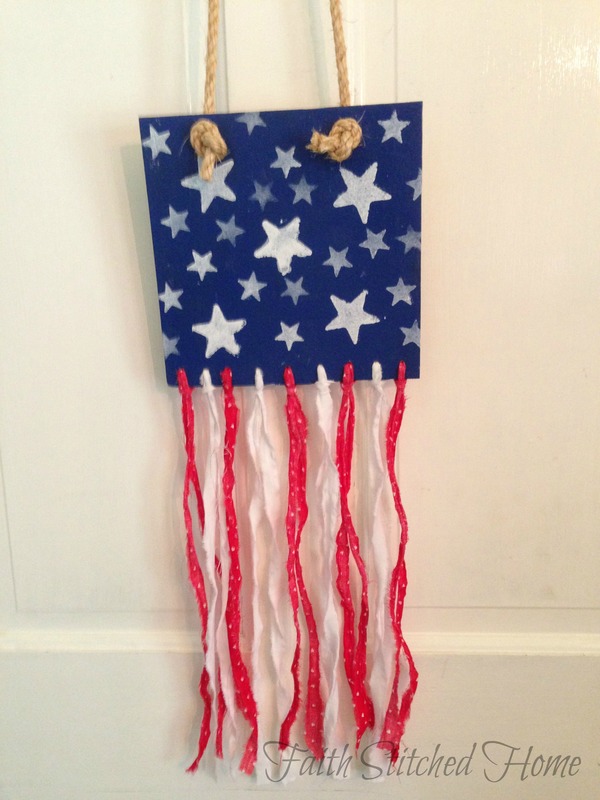 Seems like I’m stuck on painted flags for this year’s 4th of July celebration. 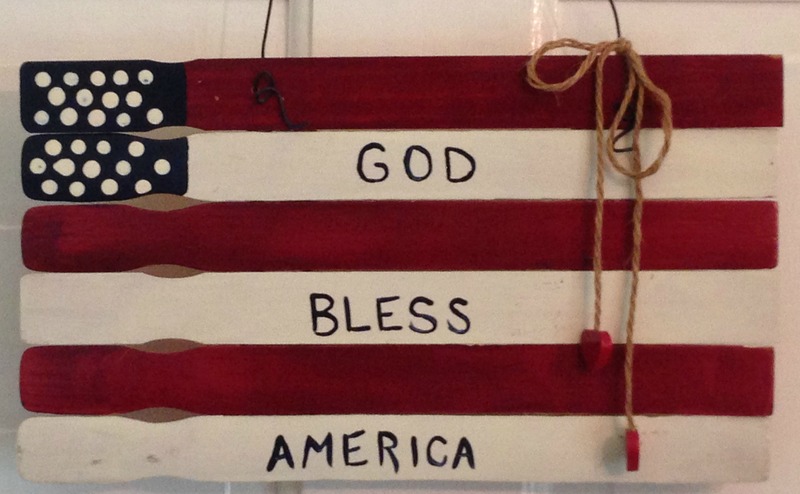 I made this flag years ago out of used paint stir sticks. After their intended use, I sanded off the blobs of old paint just enough to make them smooth and painted them with craft paint. I used six sticks for the flag itself, broke another in half and hot glued those pieces vertically across the back to hold everything in place. Then I drilled two small holes at the top and ran a small wire through for the hanger. The little jute rope with wooden hearts came wrapped around some stationary. Nothing goes to waste around here! See you tomorrow for more patriotic inspiration! God bless America! In honor of the upcoming Independence Day holiday, let’s celebrate with a weeks worth of patriotic inspiration. I’m getting a little scrappy for today’s project – as in scrap wood, fabric scraps, and some leftover (aka scrap) paint. I came across a square piece of plywood in my wood pile that I painted blue and stamped with some stars in white. I drilled a few small holes across the bottom of the wood, tore some red and white fabric scraps to length and inserted them through the drilled holes affixing with a lark’s head knot. I drilled a couple of larger holes at the top corners and fed a piece of rope through knotting it in the front to use as a hanger. Done. Quick and easy. 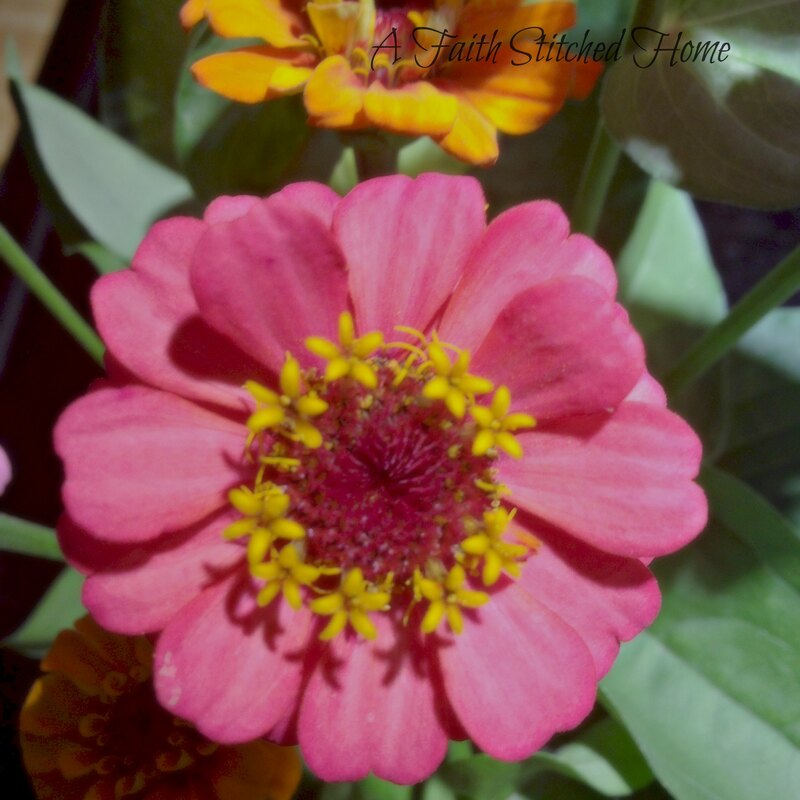 Join me again tomorrow for another easy project. Happy Birthday, America!!! I played around with some paper crafting today and with Independence Day just around the corner, I was feeling patriotic. That’s a perfect combination when you have stars and stripes in your paper stash! My youngest son decided a couple of weeks ago to makeover his room. He chose the paint colors and wall decor which inadvertently morphed into an American theme. I’ll show more of his room later when it is totally complete. Of course, I had to get involved. Fortunately my involvement was welcomed. His desk has no drawers and his pens and pencils were just lying here and there so what’s a crafty mom to do? 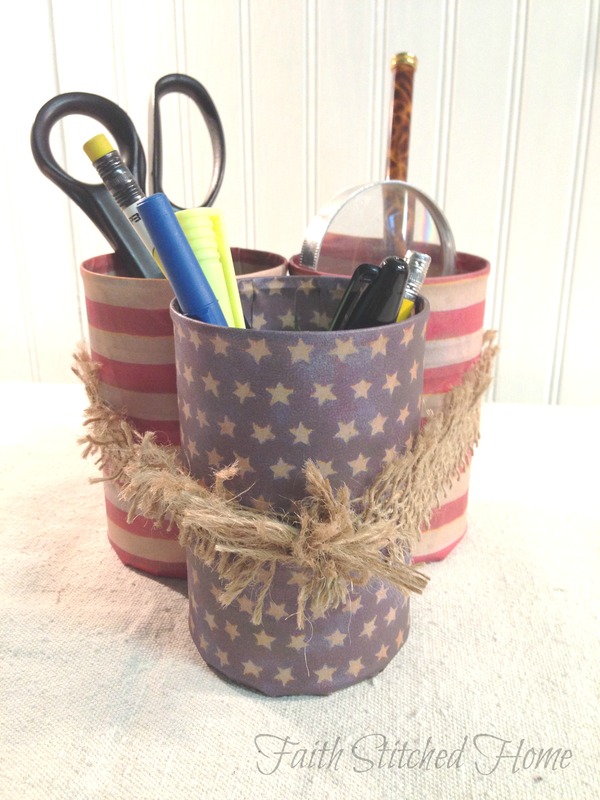 Make patriotic pencil cups, of course! This project was simple and I actually took photos of the process. Perhaps I’ll even try to make my first ever tutorial out of it! Stay tuned! Okay, so I finally did it, but not without a lot of fretting. This is my first blog post and suddenly I have nothing to say. For those that know me, they would be shocked. Lets hope I get over my giddiness, find my voice, and create posts that will be thoughtful or informative or inspiring. I’ve dreamed of this for probably the last 7 years and finally I am taking the leap – a leap of Faith. Yea, I’m a little slow; maybe intimidated is more like it. All this techie stuff is not me but I’ve got to start somewhere so forgive the many mistakes I will probably make along the way. I’m going to give it my best shot. My goal is to share things that I love – my faith, family, home, projects. I hope that I can inspire or help someone along the way or record a memory for those that love and support me. Lets see where this takes me. I’m looking forward to it!